Pizza in a crispy, golden, snackable crust! Available in a number of varieties, including cheese, pepperoni, and combination. Pizza Rolls make everything you enjoy more enjoyable. Pizza Rolls are easy to make and only take 60 seconds in the microwave. 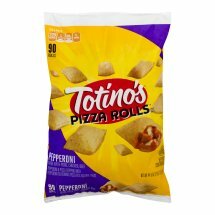 Take Pizza Rolls to a party, instantly be the most popular and respected person there! Per 6 rolls: 220 Calories. 2g Sat fat, 10% DV.